According to ancient texts, there is significance for every ritual that forms a part of the Indian wedding, including the Haldi ceremony so let’s take a look at this wedding ritual and its significance. Like all other rituals, the haldi ceremony has its integral significance and one area where it holds the most important place is Indian wedding. When the beauty and cosmetics industry was not where it is today, the grannies and great aunts had their own ways of beautification to ensure that a couple looks radiant & wonderful on their wedding day . With its medicinal properties, haldi is nature’s best gift to mankind. With its antiseptic qualities, haldi acts as the protective shield for the bride/groom from cuts, bruises and any other seasonal ailments. Application of haldi also infuses a natural sheen and glow to the skin, readying the bride/groom for their wedding celebrations ahead. It’s almost like an ancient Indian Spa Treatment! 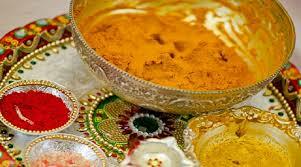 Traditionally, people make a paste using haldi and different ingredients according to their individual family customs. While some mix it with sandalwood powder and milk, others mix it with rose water. Nowadays readymade haldi packets are easily available in the market. This paste is then applied on the bride and the groom’s face, neck, hands and feet, by their near and dear ones. This ceremony is performed at bride & groom’s house respectively, is also accompanied by traditional songs and dances at times. It is believed that once the haldi ceremony takes place, the bride/groom is not allowed to step outside till their wedding. After the haldi ceremony, when the paste is rinsed off, it helps to get rid of dead cells and detoxifies the skin, leaving a radiant glowing skin. Usually the mama (brother of bride/groom mother) makes the bride/groom stand from their haldi seat generally called bajot (a wooden decorative seat with approx. 4 inches legs. 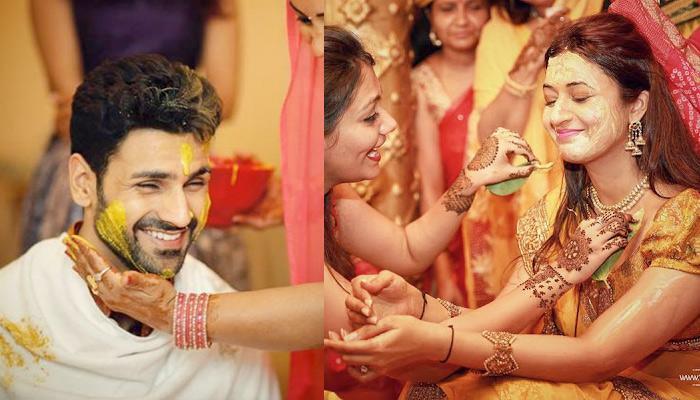 While modern-day brides have an array of services to choose from the best salons, the age-old traditional haldi ceremony has still managed to enamor all. The color yellow is also considered auspicious, ushering in prosperity and happiness for the soon-to-be married couple’s conjugal lives. Hence, mostly the bride/groom is made to wear yellow attires while haldi is applied to them. The normal haldi (which is also called pithi in Gujarati) is completed this way. The rituals differ somehow as per the caste. Previous story FRIENDSHIP DAY CELEBRATION..